Spotify got the entire music business talking last week with the news that it has started offering artists the opportunity to directly distribute their material on the platform – without the requirement for a third-party aggregator or record label. Why might an independent artist choose to strike a direct distribution agreement with Spotify rather than another company in the music biz? We now know a little more about Spotify’s offering. The skinny: Spotify’s Kene Anoliefo – Senior Product Lead, Creator Marketplace – has confirmed to MBW that the company is paying 50% of any pro-rated net revenue generated by directly-distributed artists to the performer/recorded music rights-holder concerned. We’ve also checked in with our US label sources, and confirmed that – based on the new major label licensing agreements signed last year – Universal, Sony and Warner receive a slightly higher percentage than this 50%. The majors, we’ve confirmed, now receive 52% of the pro-rated net revenue their artists generate on Spotify. 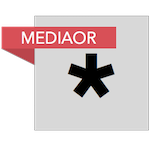 The same 52% deal, we’ve learned, was also agreed between Spotify and Merlin, which negotiated on behalf of many of the world’s leading independent labels and distributors. So… why would an artist do a direct deal with Spotify? An emerging artist who has signed a ‘traditional’ deal with a major (fast becoming obsolete, it must be said) where approximately 80% of revenue is maintained by the label and 20% is paid out in royalties. Let’s assume for simplicity’s sake that Spotify has calculated that, in one month, an artist in each case has, on a pro rata basis, generated $10,000 in net revenue on its service. 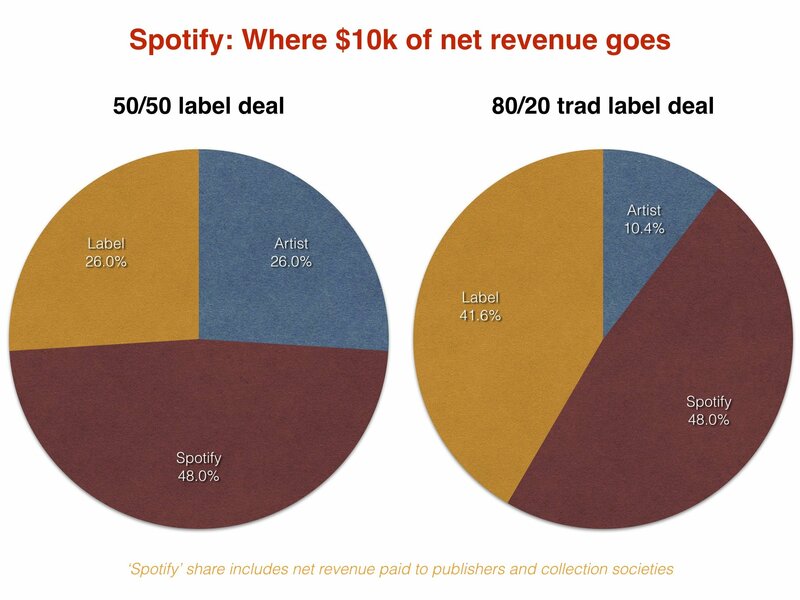 With a direct Spotify deal, where 50% of net revenue is paid out, the artist obviously ends up with half of the $10k (ie. $5,000). Then, the distributor keeps 15% of this $5,200 ($780), leaving a net payout to the artist of $4,420 – smaller than the $5,000 they would have got from Spotify direct. Onto the 50/50 label deal. In this case, Spotify again pays the major $5,200 (52%) of the $10k generated. This money is then split equally between label and artist – with $2,600 going to each. That is just over half the net figure the artist would receive direct from Spotify ($5,000). Finally, let’s examine the traditional 80/20 major label deal. In this scenario, the label would keep $4,160 of the $5,200 shared by Spotify – leaving the artist $1,040… nearly a fifth of the size of the cheque they would have gotten from Spotify’s direct distribution option. 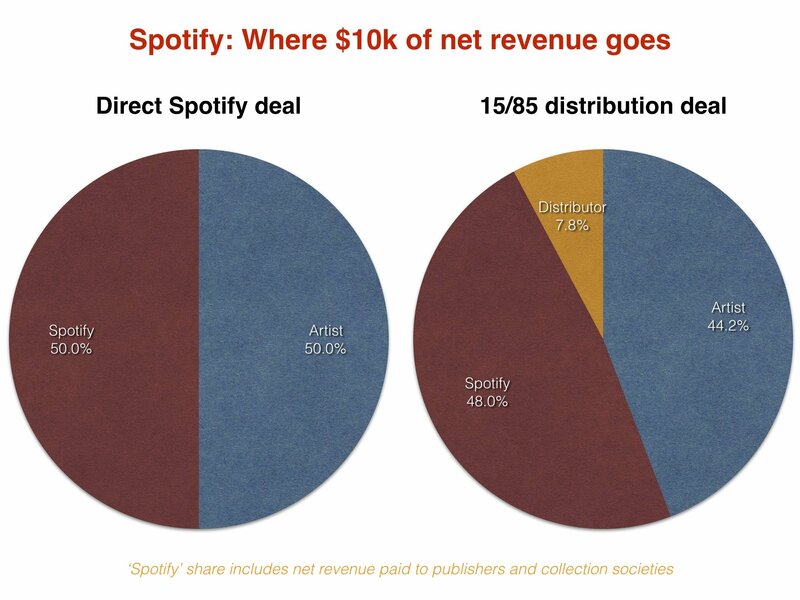 So… should artists just go direct with Spotify in order to earn the most money? As with most things in the modern music business, the answer to that question is far from simple. Ultimately, it all comes down to another huge question: how can an emerging act grow their fanbase to the point that they’re generating $10k a month on Spotify in the first place? This is where labels make their strongest case: without us and our global marketing might, they say, you might get a higher percentage of the payout from Spotify… but that payout wouldn’t be anywhere near the size that it could have been. A direct distribution deal with Spotify gives artists an important new option on the world’s biggest subscription streaming platform. Yet, according to Midia Research, Spotify holds just 38% of global market share in music streaming by revenues. Major record companies, just like music distribution companies, will be quick to remind artists that placing all of their hopes with a single streaming platform may prove a potentially imprudent strategy in music’s complex commercial landscape. Spotify, though, will be keen to demonstrate that they can take an independent artist from the very first step of their career through to relative superstardom – without any outside interference.